The energy around apprenticeship programs—which combine paid on-the-job training and classroom instruction—is encouraging. But the devil is in the details. Creating 5 million apprenticeships is a tall order in a nation that currently has only roughly 500,000 apprentices.6 Therefore, it is critical that the administration take care to grow these programs thoughtfully and include safeguards to ensure the programs created are high-quality and meet the needs of workers and employers alike. This issue brief describes why the current apprenticeship system is successful. It also reviews the actions taken so far by the Trump administration, Obama administration, and Congress to expand apprenticeship, making the case for maintaining—and even strengthening—the quality of apprenticeship programs as policymakers seek to expand their use in the United States. The Registered Apprenticeship system was first established 80 years ago under the National Apprenticeship Act, also known as the Fitzgerald Act.7 While apprenticeships had existed for centuries before the law was enacted, the Fitzgerald Act ushered in the era of the modern apprenticeship by enacting labor standards to “safeguard the welfare of apprentices.” The regulations established under the act require apprenticeship program sponsors—typically employers or unions—to meet certain requirements in order for the DOL to recognize their programs.8 For example, these programs must involve employers; offer structured on-the-job training and related technical or academic classroom instruction; and have a progressively increasing schedule of wages.9 Registered programs culminate in a nationally portable and recognized credential issued by the DOL. Today, Registered Apprenticeship is widely considered an effective training strategy that leads to quality employment, equips workers with job-relevant skills, and helps employers meet their current and future workforce needs. The underpinning of all Registered Apprenticeship programs in the United States continues to be the labor standards that exist to safeguard workers’ welfare. Because of these standards, apprenticeships are lauded by policymakers, employers, workers, and other stakeholders as the gold standard of worker training. President Trump’s June 2017 executive order called on the administration to take several steps to further expand apprenticeships. The order directed members of President Trump’s Cabinet to use existing funding sources to promote apprenticeships; expand access to underrepresented groups, including high school students, the formerly incarcerated, disconnected youth, and veterans; and support incorporating apprenticeships at postsecondary educational institutions. The order also established a new Task Force charged with identifying “strategies and proposals to promote apprenticeships.”15 The Task Force’s duties include reporting on strategies to establish new industry-recognized apprenticeships. When the task force met for the first time in November, Secretary Acosta kicked off the convening by asserting that the Registered Apprenticeship system “does not work” and that a parallel “industry-recognized” apprenticeship system is needed to scale apprenticeship programs nationwide.16 This move to establish industry-recognized apprenticeship programs is perhaps the most significant shift from Obama administration policy. These programs would be certified by third parties—including trade or industry groups, companies, nonprofits, unions, and joint labor-management organizations—instead of the DOL. While the administration appears to be moving forward with plans to overhaul what it has deemed an ineffective Registered Apprenticeship system, it has neglected to articulate clearly the barriers that it perceives are holding back apprenticeship growth, or a vision for expansion that would not undermine existing programmatic standards. Moreover, it is possible that the administration, in its effort to reform the existing system, could ultimately weaken labor standards and the protections that ensure apprenticeship programs lead to good outcomes for workers. 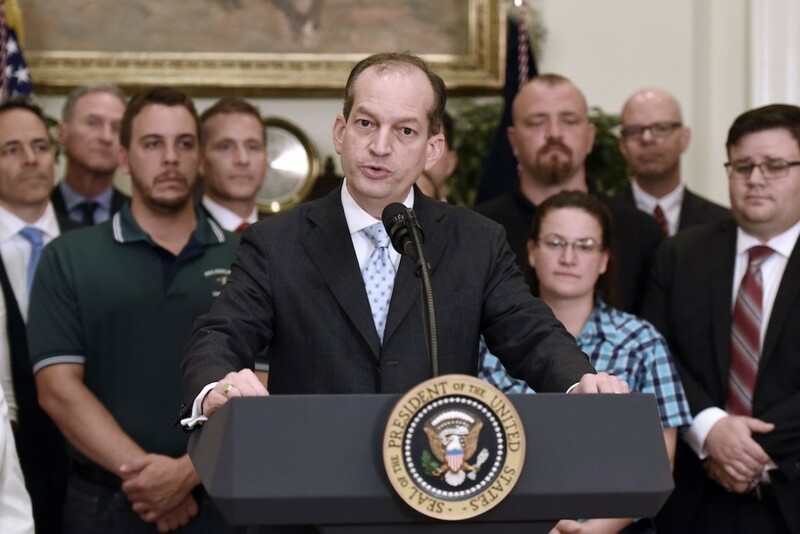 If the Registered Apprenticeship system is, as Secretary Acosta says, broken, it remains unclear why the administration is not focusing its efforts on reforming the current system but instead on creating a new system that is duplicative of the existing one. By establishing a parallel system, the administration risks compromising program quality among new programs and Registered Apprenticeships alike. The Registered Apprenticeship credential sends an important labor market signal for both workers and employers. For workers, the credential aids in labor market mobility, demonstrating to potential employers that workers have the skills and experience necessary to do the job. Similarly, employers rely on the credential to indicate what skills, knowledge, and abilities a worker possesses. Creating a parallel system using the same term—apprenticeship—will likely breed confusion among employers and workers. It will make it more difficult for employers to discern whether a worker who has completed an apprenticeship program received training that meets rigorous standards or whether they participated in a lower-quality program that goes by the same name. Such confusion will almost certainly make the credential less portable across employers and geographic regions. Currently, the DOL, or a state agency acting on the department’s behalf, has the power to recognize apprenticeship programs and to hold them accountable for meeting and maintaining certain quality standards. By comparison, the order directs the secretary of labor to establish guidelines or requirements third parties can or must follow to ensure that industry-recognized programs meet quality standards.18 This language suggests that third parties could have substantial discretion in determining the standards underpinning industry-recognized apprenticeships, potentially with little federal oversight and fewer opportunities for enforcement. Increasing federal resources to support apprenticeship programs is a worthwhile goal, one that the Center for American Progress has strongly supported.23 While there are already several federal funding sources that could be used to support apprenticeship programs—such as the Workforce Innovation and Opportunity Act and, in some instances, federal student aid programs24—there is currently no ongoing funding source dedicated solely to apprenticeship programs. Congress has done its part by appropriating funding for apprenticeships in the past two spending bills, but dedicated, reliable funding is necessary to make program growth sustainable. When those investments are coupled with efforts to weaken federal oversight, however, there is heightened potential for waste or abuse, which in this case will surely come at the expense of workers. It is unclear what purpose the business-led review panel would serve beyond adding another layer of bureaucracy to the grant-making process. Federal agencies are frequently tasked with designing, reviewing, awarding, and overseeing grant programs and are certainly equipped to fill this role themselves. Moreover, a business-led panel reviewing grants to business and higher education partnerships could create conflicts of interest. For example, a conflict could arise if a trade association is charged with reviewing an application that involves one of its members. Finally, the grant program fails to include two essential partners for apprenticeship programs: the DOL and labor unions. The bill suggests that the program would be entirely administered by the Department of Education, despite the DOL’s experience administering apprenticeship programs. The bill also fails to spell out a role for organized labor, which has been responsible not only for sponsoring many of the apprenticeship programs that exist today but also for sustaining and advancing the model over the past several decades. In its current form, the bill would potentially create additional confusion for employers and workers, as well as result in lower-quality apprenticeship programs. To be sure, the Registered Apprenticeship system is not without flaws. Too few employers participate; programs are still largely confined to a handful of industries; and far too often, women and people of color are unable to gain equitable access to these programs. Unfortunately, the Task Force, June executive order, and recent congressional proposals are unlikely to meaningfully address any of these problems. In fact, a parallel track that lacks adequate worker protections could ultimately lead to a new problem: the proliferation of low-quality programs that do not offer the skills or wages for which apprenticeships are known. The 2015 and 2016 studies suggest that the process of boosting program quality is ongoing, but these actions to reform the system by introducing safeguards are a step in the right direction. Rather than focusing on expanding programs of questionable quality, the administration and Congress should seek to address some of the real challenges holding apprenticeship programs back in the United States. To that end, policymakers should seek to strengthen program quality and make it easier for employers and workers to engage in high-quality apprenticeship programs. Policymakers should seek to facilitate the expansion of apprenticeships into new industries—such as health care, information technology, financial services, and child care—through targeted grant-making and the provision of technical guidance and assistance. Policymakers should also work to ensure equitable access to apprenticeship programs and to improve completion rates among women and people of color, who far too often are found either in the lowest paying occupations or left out of apprenticeship programs altogether.43 The administration can help ensure more equal access by continuing to support equity intermediary contracts that are intended to make apprenticeships more diverse. The administration can, for example, require apprenticeship grantees to prioritize outreach and supports to help underrepresented groups enroll and complete programs and enforce equal opportunity employment rules governing apprenticeship programs. Policymakers should also be clear in defining what programs federal legislation or administrative action will support. For example, if Congress seeks to fund earn-and-learn programs instead of apprenticeship programs, the law should be clear on the distinctions. To the extent that the process of registering apprenticeship programs is too complicated for employers, the administration and Congress should seek to reform registration in a manner that does not compromise program quality or quality assurance or otherwise harm workers. Registered Apprenticeship programs are an important tool to help raise workers’ wages, equip them with in-demand skills, and meet employer needs. These programs are effective because of the rules of the road that guide their development and execution. Workers need these safeguards to ensure that they are being paid for their work, receiving job-relevant training, and earning a credential that has labor market value. The administration and Congress have rightly recognized that apprenticeship strategies are effective for workers and employers alike. However, recent efforts to grow these programs appear to be coming at the expense of the quality standards essential to their success. Policymakers owe it to workers and employers to get the details right. Angela Hanks is the associate director of Workforce Development Policy for Economic Policy at the Center for American Progress.